It’s June, berries are in season and strawberries are everywhere. Strawberries are low-carb (around 6g net carbs per 100g), and so are some of their traditional companions like cream. Perfect combination for a low-carb dessert with a seasonal flavour! 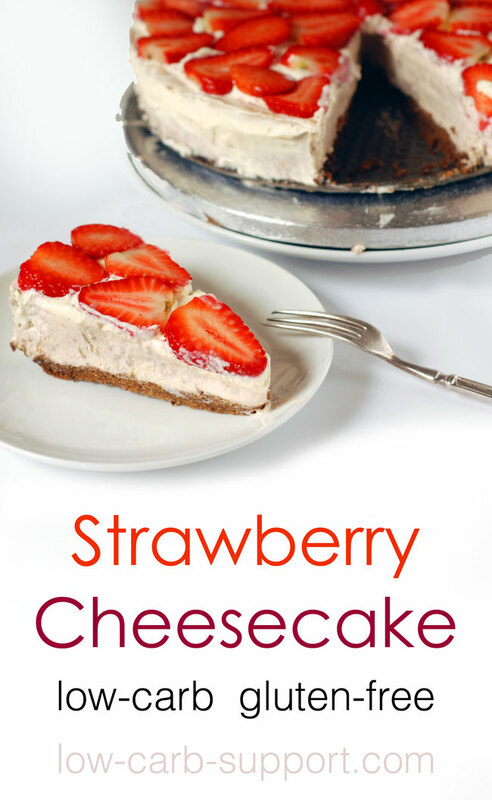 I have seen many low-carb strawberry cheesecake recipes (links to some of my favourites are provided below), and I got inspired. 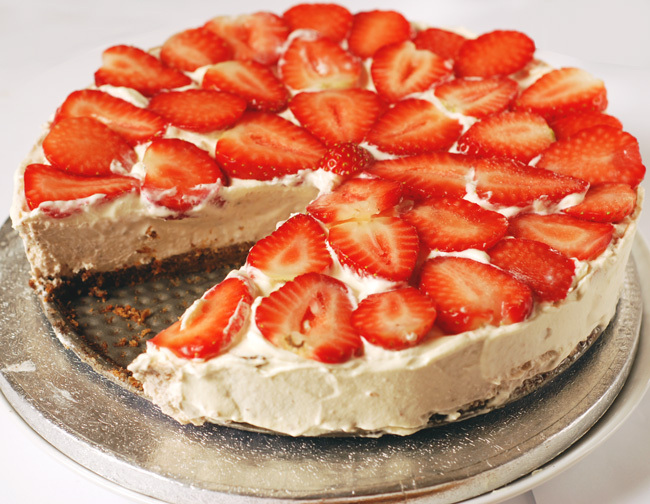 I already have a low-carb cheesecake recipe which tends to perform consistently well, so I just had to adapt it to include strawberries instead of my usual chocolate flavour. New York style vs Italian style. 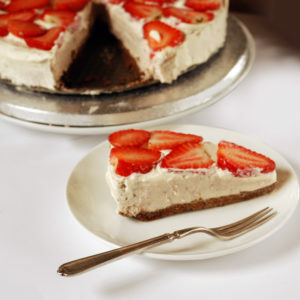 In this recipe, I am going for the more common New-York style cheesecake, which uses cream cheese for the filling, whereas Italian-style cheesecakes use ricotta or cottage cheese. Baked rather than no-bake. There are recipes available for no-bake cheesecakes (usually with gelatin as a thickener) but I enjoy a challenge, so I usually go for a baked one. Almond flour and flax for the crust. There are many ways to create a low-carb cheesecake crust. I use a mixture of almond flour and flax meal. Flax adds fibery crunch to the texture which makes it similar to digestive biscuits used in traditional recipes. if you don’t like flax, substitute with any other ground nuts or seeds. Strawberries added to the cream cheese mix. I really wanted to mix my strawberries in with the actual cream cheese mixture. This makes it a bit more tricky, as strawberries add extra moisture and acidity to the balance. I counteracted that by adding a little bit of xanthan gum – you can also use guar gum, arrowroot or coconut flour instead. If this seems too complicated, you can always skip this step and add strawberries as a separate layer – just chopped up in thin slices, or mashed into a puree. The following factors are important for your cheesecake quality – do not compromise on these. Use proper full-fat cream cheese – not reduced-fat or reduced-calorie. Hopefully you would do this anyway, but this is really important for the cheesecake texture. Bring all your ingredients to room temperature before cooking, this is especially important for the cream cheese and eggs. Bake the cheesecake slowly on low temperature, let it cool completely and refrigerate for the required time. Don’t be tempted to speed up this process – it won’t be to your cake’s advantage. Check your cheesecake regularly – when the edges are set and looked puffed up, it’s time to let it cool. The centre will look soft and caved in, but this will even out. Switch off the oven and let it cool completely with the cheesecake inside. Do you need more low-carb baking and dessert recipes? Do you want more low-carb berry recipes? I did a round-up of some further berry-based recipes in the June issue of Low Carb Support Newsletter. Please have a look and subscribe if you would like to receive monthly round-ups of recipes. Rather disappointed with this, very little flavour Texture is great. We tried on same day as making so after reading the comments on hear am hoping it will taste better tomorrow. Can I put more strawberry’s in to improve the taste or will it affect the consistency? Sorry to hear it did not turn out well. Did you make any substitutions? I made this yesterday. Patience is definitely recommended, in that it tastes better the day after. The base was the most successful that I’ve ever made, and I loved the texture. I would like to make it more strawberry – would it be more runny though if I just added more, or is there some way that I could adjust it. Also, I ended up with a brown peel on the top – tasted ok (or it peeled off, – can you tell me why this occurs). And lastly, can I freeze this? I shall definitely check out more of your recipes!! Thank you Lisa, I am glad it turned out ok. The brown peel – hmmm, maybe reduce oven temperature? It should be ok to freeze. I think adding more strawberries shouldn’t be a problem. For the Truvia how much is 1 cup in grams? Is it about 200g? Hi, yes, it works out as 190g for me. I’ll make this for Sunday dessert. It looks yummy!